“Christ became obedient to the point of death, even death on a cross. The Palm Sunday text has always struck me as a bit strange, but I remember as a child that Palm Sunday was one of my favorite days of the liturgical year. The children lead a big procession through the congregation, waving our palm fronds. Some years, we even followed a donkey carrying whoever was playing Jesus. It was always a joyous celebration. Yet, the celebration of Palm Sunday is short-lived, followed quickly by the betrayal on Maundy Thursday, the crucifixion on Good Friday. In my home church, we burn the palm fronds of Palm Sunday and use the remains for the imposition of ashes the following year on Ash Wednesday. This incineration of the palm fronds symbolizes, for me, how quickly this celebration of Jesus’ entry into Jerusalem is forgotten. The author of Matthew tells us the crowds praise Him singing “Hosanna to the Son of David!” (2:9). At the same time “the city was shaken” (2:10). The NRSV version reads, “When He entered Jerusalem, the whole city was in turmoil” (2:11). If this is a celebration, why are the people uneasy? Jesus enters on a donkey, not with the regal entrance that some may have expected. Does this humble entrance unnerve them? After He enters Jerusalem, Jesus immediately enters to temple and drives out those who were using it as a market place, reclaiming that the temple is meant to be a holy place. Does his explicit proclamation make the people uncomfortable? Perhaps they are confronted with their own complicity in sacrilegious action and would rather Jesus not call out their self-serving actions. At the same time that people are “shaken,” they are also excited claiming “Hosannas!” Were they swept up in being part of the crowd, caught up in momentum of such an exciting arrival? Jesus knows that His entrance to Jerusalem will lead to His death, but what about the crowd? Where are we in that crowd of people gathering fronds? Are we excited for Jesus’ arrival on Sunday, only to demand His crucifixion on Friday? Draw us near to You. Of discouraging news, Of protests, Or false prophets. Keep our eyes and our hearts ever focused on you. Focus on: Community: This passage prompts us to consider our commitment to Jesus. I think this text relates well to the pillar of community. I understand community to mean a commitment to one another, through the tough and joyous times. It can be easy to rejoice, but what happens when the going gets tough? Where are the crowds of praise when Jesus hangs from a cross at Golgotha? It seems to me that the people only want to praise Jesus when it is easy, safe, and popular. This is may be an ancient text, but the question is ever-present, where do we stand? Are we in communion with Jesus? Will we move with the whims of the crowd, or will we learn to stay true to our God? Especially in challenging times when the voices of false prophets ring loud and demand our attention, we must choose to listen to the still small voice of our Lord. This season of Lent, what does it means for us to claim that we are followers of Jesus? How do we commit to Jesus, to make the kingdom come? Service Inspiration: Whenever I need to see an example of a true follow of Jesus, I look to my grandparents. They have modeled what it means to rely on God in times of uncertainty, and in times of unpopularity. Their lives have been a witness of what it means to walk humbly with God. On Christmas morning this year my 87-year old grandfather preach about staying true to God’ call, affirming that only God can be our true savior, that no political system can provide us the true transformation and salvation that we need and seek. 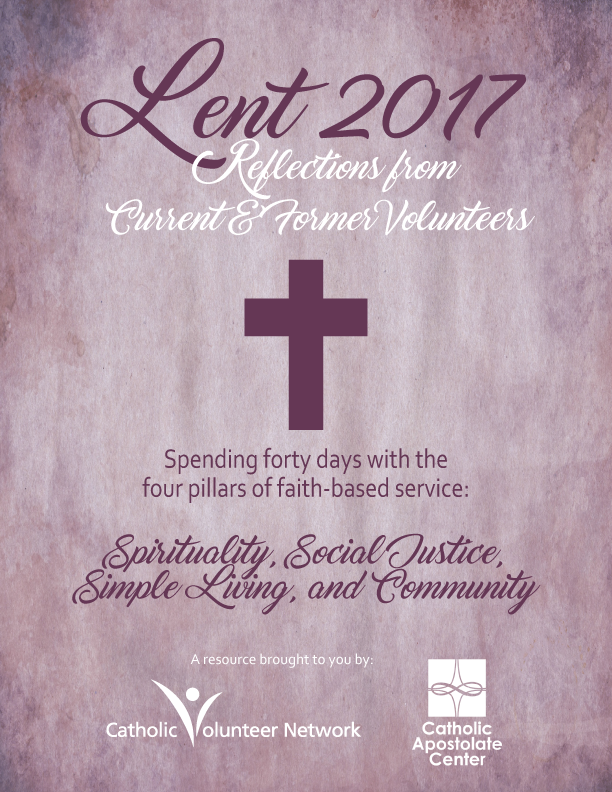 Forty Days with the Four Pillars of Faith-Based Service: This reflection is part of our annual Lenten Reflection Guide, a collection of reflections written by current and former volunteers. We are pleased to offer this resource through our partnership with the Catholic Apostolate Center. 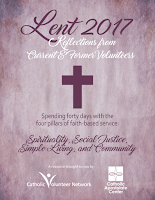 To download the Lenten Reflection Guide, please click here. About the Author: Anna Jeide is a Minnesota native, daughter of a female pastor, graduate of Luther College, now serving with Lutheran Volunteer Corps in Washington D.C. at La Clinica del Pueblo. She loves to sing in choir, read, travel and explore the outdoors. She is looking forward to whatever adventures come next after LVC and is discerning how to be a committed Christian in the heart of the capitol.